The challenge of getting information on the whereabouts of the thousands of millions of dollars that have officially been pumped into this region after civil war ended in 2008, had already become clear to me when two acquaintances who work for NGOs had mysteriously gone AWOL when I had wanted to talk to them. And after a few days travelling around in the region, from Guémon and Tonkpi to Moyen-Cavally, and trying to speak to locals in Man, Guiglo and Bangolo as well as Duékoué, I had begun to feel decidedly uneasy about the widespread reluctance of people to talk to me about the projects that they were the intended beneficiaries of. It was clear that hundreds of NGOs, foreign aid agencies and two multibillion dollar World Bank- and donor-aided government programmes so far hadn’t improved much in people’s daily lives. Most people still didn’t have clean drinking water. Or jobs. Or help with their near-starvation subsistence farming. The reports published by government, World Bank and the different independent NGOs, which displayed numbers of thousands of houses built, thousands of village pumps in good working order and “over 16 000 war-traumatised youth now gainfully employed in public works projects (1),” were all the usual shiny PR, without much to show for it on the ground. I had expected that. Pumps break down, jobs are temporary: it is the story of NGO projects all over Africa. Even the fact that much-advertised donor-funded housing for 30 000 returning refugees had materialized in the form of only a few hundred brick shelters, most of which were unoccupied and already in need of repair had not startled me. What I had been unprepared for was the silence. The atmosphere was almost as if a mafia had imposed an ‘omerta’ oath on the entire region. Local journalist Sehi Beh explains that locals fear the “state officials” who have cornered the development aid contracts “to deliver goods or services through their own companies, then get the projects done in their areas of origin, instead of where the needy populations are.” Hermann Francis, a former human resource officer with the Adventist Development and Relief Agency ADRA in Duékoué , tells me that senior government employees used to exercise ‘enormous pressure’ on him to get the NGO’s jobs and deals. “Requests (for jobs for themselves or friends or relatives) would come whenever we posted job ads, to employ relatives and friends of such senior civil servants.” Francis says he habitually refused their requests. But many local projects, fearful of those who hold state power, do recruit the ‘protégés.’ A 2014 audit by the Abidjan-based headquarters of ANRMP (National Authority for Public Procurement Regulation) (2) confirms that illegal awarding of aid contracts is widespread: 58 out of 60 public contracts over the period 2011-2013 were awarded without prior publication. ‘‘[…] in 95% of all cases, the reasons adduced for such practices (were) unfounded,’’ the report said. The government anti-corruption agency, the ‘High Authority of Good Governance,’ (HABG) says they are “fully aware of the scope of the problem.” “We urge the populations to denounce any act of corruption or mismanagement of funds allocated to development projects. To this end, we even set up an online platform that allows anonymous submissions,” says HABG official N’Guessan N’Dri. Remarkably, Ivory Coast household surveys show a tremendous drop in poverty between 2008 and 2015 in the rural West. According to the Ivorian National Statistics Institute (INS) 2008 survey, poverty in the region was then still at a 67,8 % high. In 2011, it noted a drop to 60,5 % and a further drop to 56,1 % in 2015 (4). The Ivorian government has used these statistics to laud its own and donors’ reconstruction and development efforts in the region (5). But there may be other factors at play. In 2008, the civil war had officially been won by the dominant political elite under Laurent Gbagbo, who became president. A large number of the underprivileged ethnic group in the West -the group that had rebelled-, went into exile after that, which means that in 2011 a large number of poor people were simply no longer there. More importantly, those poor who were still there were actually poorer than they had been before. The 2015 survey mapped out that most of the 56,1 % people living under the poverty line of US$ 1,30 per day had seen their income shrink to less than half that. 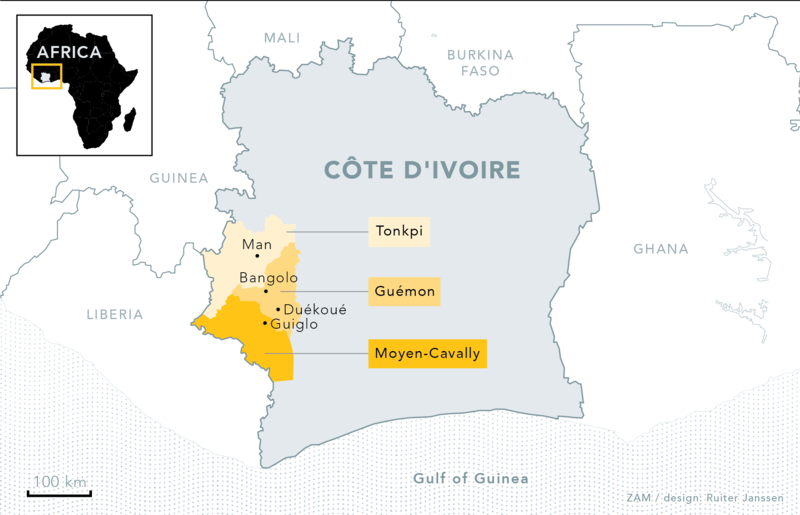 When the positive figures about the poverty decrease were released, the FPI and its allies accused the government of inflating the figures and lying to Ivorians and donors about the true costs of living in the country and the poverty rate. In response, government spokesperson Bruno Kone, declared that it was “punishable under the law” to “incite the citizenry to boycott” the population census. (5) It must be borne in mind that the surveys are usually funded by donors and also that the state officials who count the surveys may feel pressure to report positive developments. “Donors want to see results” is an often used phrase among those who are tasked with reporting on development projects. The Post Conflict Assistance Plan Survey (PCAP) of 2013 by the INS is an illustrative case. The team, tasked to survey the ‘satisfaction rate’ of citizens with regard to construction projects implemented by the PCAP, found 28,6 % of respondents in the western region “completely satisfied.” But it put 69 % of respondents in the category ‘partially satisfied,’ without differentiating between ‘very little’ or ‘a lot’ satisfied, finally listing only 2,4 % as “not satisfied at all.” In other regions, including the equally affected north, the number of ‘partially satisfied” people amounted to over 75 % (In Tanda, north of Abidjan, it was 100 %.) According to the introduction of the survey, the exercise was paid for by the PAPC itself and PAPC management also formed part of the survey’s terms of reference and management units.